If you missed out on the pre-sales this morning, there are still a few sites slated to release the Special Edition of Zelda: Breath Of The Wild Tomorrow March 3rd. Sneakerhead and gamer seems to go hand in hand so if you need to pick up one of the best reviewed games on the most beloved franchise in Nintendo history, here’s your chance. 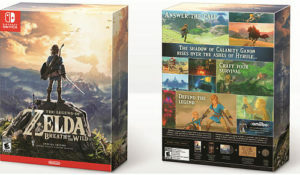 Presales sold out quickly so make sure you have a site monitor running if you want to grab the limited edition Zelda: Breath Of The Wild for Nintendo Switch.